If you regularly attend conferences or meetups–you will encounter these questions again and again. Think these questions are just simple and friendly conversation? Think again. These questions are opportunities for creating ambassadors and followers of your brand–but only if you answer them correctly. If you want to make the most of your time at events–you need to be remembered. You need to create awesome impressions. Here are a few tips for being remarkable at conferences, starting with that crucial introduction. How to properly introduce your blog to somebody face-to-face. FYI, I straight-up stole much of what you’re about to learn from Clay Hebert. I’m going to simplify everything he teaches, but you can find his keynote on introductions here. It’s great! What we’re going for is intrigue. You will get a chance to spell out the details behind what you actually do on your blog–but that information will fall on largely deaf ears unless prompted! [help] = how do you serve your readers or customers? There are several words you can use here, based on how you feel you actually connect with people. [people you help] = your avatar reader, ideal customer, etc. Who do you serve and how do you serve them? [result or achievement] = the end result of the transformation you’re helping people with. Where is your audience going? I help single moms be hyper-productive. I connect entrepreneurs to powerful investors. I help bloggers turn their passions into six-figure businesses. I teach magicians how to get paid. Those examples are probably B+. To get to A+, they’d need to be a bit more intriguing and really prompt a back-and-forth dialog. Again, Clay Hebert made this up, not me. I’m the [x] for [your space]. This is tough to understand with examples. We know what a personal trainer does, yes? Here are some examples I made up for people in the blog-o-sphere. geez, Liz is a pro. 1 – Be the person everybody already knows. Couldn’t agree more with that last point, Liz. Yes, I’m aware it’s tough for the anonymous among you, by the way. 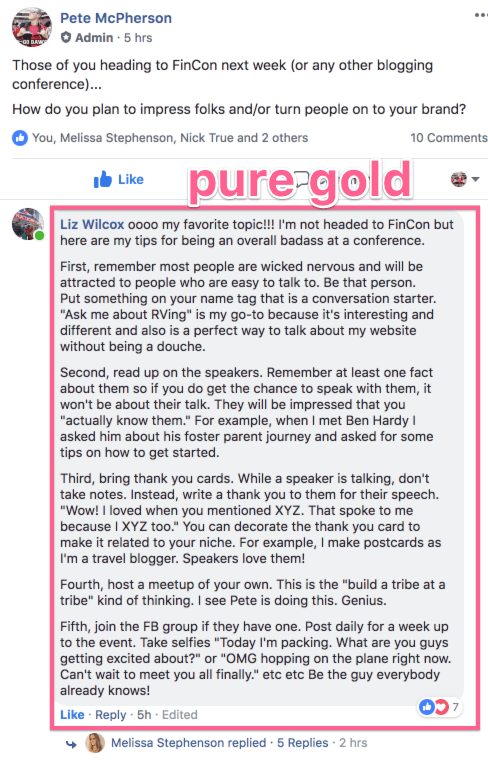 Great tips about posting in the Facebook group, and I’d also make a point to just be connected with other people who will be at your conferences and meetups. Follow them on twitter. Actually engage. 2 – LISTEN to people! Actually listen. Really, technically and spiritually listen to them. 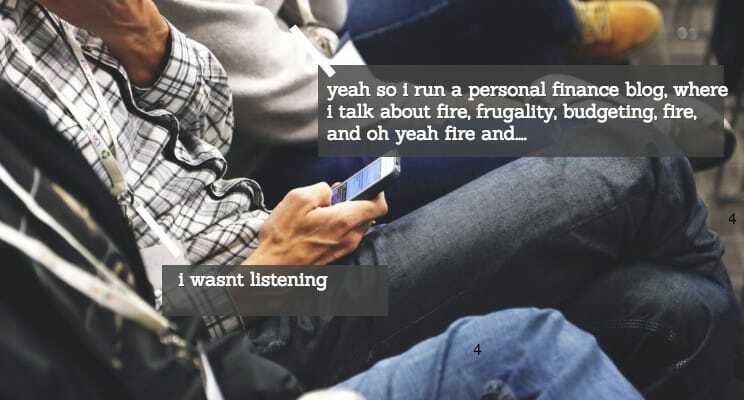 It’s easy to talk about yourself, and surprisingly not-effective. Take a page out of Dale Carnegie’s most famous work, and turn the conversation over to the people you meet! If you focus on sincerely getting to know people, not only will know how you can help/collaborate/work with/connect with them better–they’ll likely appreciate being listened to. Everybody does. PT Money (founder of FinCon) is extraordinary at this. Talk to him at conferences (or anywhere) and the conversation is almost immediately shifted to you and what your business is up to. He’s a pro. 3 – Want to effectively approach people (and be more approachable?) Smile more. At one point, I noticed keynote speaker and GURU-blogger Darren Rowse, Mr. ProBlogger himself, just wandering around the expo hall aimlessly. Just chillen. Similarly, if you’re an introvert (high five, brothers and sisters), and simply want to appear more approachable to others, the same tactic works. A confident smile is an ultimate turn-on and a clear signal for influencer status–even for non-influencers. It makes you more approachable, welcoming, and approx. 10,000 other benefits. 4 – Just be yourself. I know I’ve presented a lot of “try to do this and this and this” in this blog post, but ultimately Jim is correct. Don’t attend in-person events with grand plans to seem like a bad@$$ to every person you meet, or to walk away with a 7-figure business deal. Making real friendships is still your ultimate goal, whether it be with famous bloggers, brands, or just people you really enjoy being around. THAT’S the key to an amazing conference. I’m the socially-awkward but tech-savvy roadie for rockstar bloggers. Or maybe their opening acts. Either/or. p.s. – Liz Wilcox kicks bootay. I’m a car mechanic–for your website optimization. Stuck with website problems? I’m the WD-40. I’m that guide who’s bold (or crazy) enough to try it first. I’m the Dee Dee keeping Dexter bloggers from serious harm. I’m still figuring out my brand, but funny enough this exercise actually helped me focus. “I help people figure out money for the most important things”. I’ll work on getting even more specific as I keep developing. haha right? I should set up a booth for this at FinCon. That’s perfect! I’m imagining something like Lucy’s booth from the cartoon Peanuts but instead of “Advice 5 cents” it’s “Intros on the spot, $5”. I help people hold on to the things worth holding on to. Thanks for the post! This was a fun read. I teach women how to achieve Financial Independence no matter where they start. No joke–yours took the longest to make up. I agonized for several minutes over that one, but I’m proud of it now. Omggggggg I feel so famous!!!!!!!!! I’m the Larry David of RVing. Okay, now I need to brag some more to my husband about these references. Seriously though, as an annonymous blogger who doesn’t know anyone personally and isn’t a natural in social situations this is great info. Hope to see you at FinCon. I want to make you filthy rich!